Most of our moose antlers are all natural drops or sheds from moose in Maine or Quebec. The animals were generally not killed to harvest the antler. The shed antlers were picked up in the forest. These moose antlers are sold by the piece and priced by the pound. Small pieces weigh 1-4 pounds, medium ones weigh 5-7 pounds, and large ones weigh 8-12 pounds. They are measured by the length and width of the palm, the circumference of the shank and the length and/or width of the button. Sizes are listed in our gallery below. The #1 antler is fresh, hard brown antler. The #2/3 antler is older antler that may have some chewing, more weathering, or other imperfections. Our Gxx codes denote individual pieces. 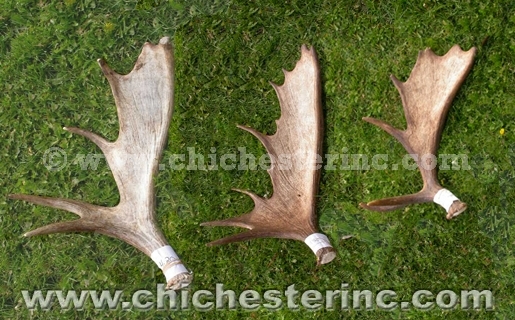 If you would like to order a specific moose antler, please go to our Gallery to pick the exact one shown.